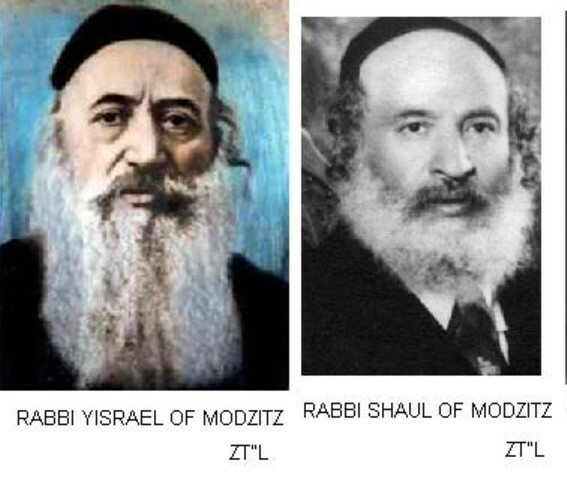 This coming week, on the 13th and 16th of Kislev, are the yahrzeits of the first two Rebbes of Modzitz, pictured above. The Shabbos before a yahrzeit is a special one in Modzitz, and many of the Chassidim and those close to Modzitz make a point to be in Bnei Brak with the Rebbe Shlita for that Shabbos. The entire Shabbos is "flavored" with a focus on the Torah and Negina of the particular Rebbe whose yahrzeit is coming up (both, in this case), infusing those present with a heightened awareness and sensitivity to the upcoming yahrzeit. The actual yahrzeit Tishes will be on Sunday night - the yahrzeit of the Divrei Yisrael, first Modzitzer Rebbe who composed the Ezkera niggun, a complex, symphonic work consisting of some 36 parts, which is sung at the Tish. It is scheduled to begin at approximately 9 PM with Ma'ariv, at the Rebbe Shlita's Beis Medrash, located 20 Rechov Habakuk in Bnei Brak. There will also be a Yahrzeit Seuda in the Modzitz Shtibel in Flatbush [Brooklyn, NY] with Ma'ariv at 7:00 PM and the Seuda to follow, led by R. Ben Zion Shenker. The Yahrzeit of the second Modzitzer Rebbe, Rebbe Shaul Yedidya Elazar, known as the Imrei Shaul, is on Wednesday night. The Imrei Shaul is considered the most prolific Chassidic composer of niggunim, with some 1,000 masterpieces to his credit. Ma'ariv and Tish are scheduled at the same time in Bnei Brak as on Sunday. In Flatbush however, Ma'ariv will be at 8:45 PM with the Seuda to follow. There is a possiblity of a THIRD Tish on Thursday, when the Rebbe comes to Yerushalayim to the Imrei Shaul's Tzion [gravesite] on Har HaZeisim [Mt. of Olives]. Watch this space! Zechusam Yagein Aleinu - May their merits protect us all! Today, 2 Kislev, is the 44th yahrzeit of HaRav HaGaon Aharon Kotler (1892-1962), Rosh Yeshiva of Beis Medrash Gavoha, in Lakewood, New Jersey, and the "father" of the American yeshivos and kollelim. He was the son-in-law of Rav Isser Zalman Meltzer, and the son of Rabbi Schneur Zalman Pines. Rav Aharon was known as the "Shislovitzer iluy [prodigy]." With the Soviet occupation of Poland in 1939, Rav Kotler escaped first to Kobe, Japan, then to the United States in April of 1941. Rav Aharon assumed a leading role in the rescue operations of the Vaad Hatzala. Under his leadership, Beis Medrash Gavoha opened in a converted house in Lakewood, New Jersey in April 1943, and the yeshiva and kollel student body increased from the original 14 to 140 in 1962, the year of his petira [passing]. 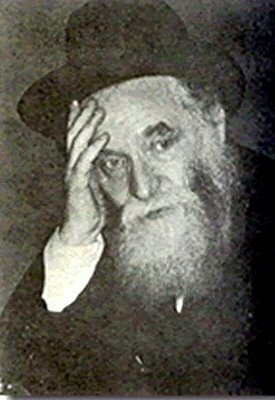 Rav Aharon also headed Chinuch Atzmai, the network of Torah day schools in Israel, founded in 1953, and he took over the leadership of Torah U'Mesorah, the American day school movement, after the death of its founder Rav Shraga Feivel Mendelowitz. He also headed Agudas Yisrael's Moetzes Gedolei HaTorah. The two great Torah giants, Rabbi Moshe Feinstein and Rabbi Aharon Kotler, both learned in the Slutzk Yeshiva. Rabbi Feinstein later became the rabbi of Luban in Russia, but when the Communists rose to power, his life was in danger because the Communists tried to uproot any vestige of Jewish life. Finally, when life in Russia became too precarious, Rabbi Feinstein and his family immigrated to the United States, arriving there in 1936. Rabbi Kotler, though, remained in Europe until World War II broke out. Eventually, after many trials and tribulations, he managed to escape from Europe, and arrived in Japan. Now that he was in a country that allowed Jews to travel, he had two choices. On the one hand, he could travel to Israel, where his father-in-law, Rabbi Isser Zalman Meltzer, had already established himself. Or he could travel to the United States and join Rabbi Moshe Feinstein. Faced with this major decision, Rabbi Kotler decided to follow the system of lots used by the Gaon of Vilna. This consisted of a certain method of turning the pages of a specific edition of the Bible, and following the direction of the verse to where this system pointed. After casting the lot, Rabbi Kotler found that the verse he had opened to read (Exodus 4:27): "G-d said to Aharon, 'Go to meet Moshe in the desert'." Rabbi AHARON Kotler understood this to mean that he was to join Rabbi MOSHE Feinstein in what was the "desert" of Jewish learning in America. 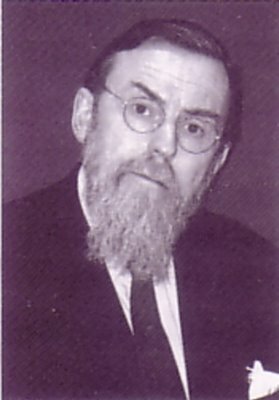 It was in the United States that Rabbi Kotler established the Lakewood Yeshiva, one of the premier yeshivos in the world. Here you can find a living ‘Mishnas Rav Aharon’ - selections from a forthcoming biographic anecdotal study of the teachings of the Rosh Yeshiva, Rav Aharon Kotler Zt'l by Rabbi Yitzchok Dershowitz. Wherein lay his power? What was the "secret" of his success? S. Kagan, in "From Kletzk to Lakewood, U.S.A." has written that Rabbi Kotler's strength as a teacher was the living example he provided of Torah rooted in his every fiber. When he taught he became completely immersed in the subject: "His face earnest and strained . . . . The fires, burning in his soul, mirrored in his eyes--those brilliant, piercing blue eyes that were a study in themselves--glowing like embers. The movements of his hands following the flow of his words--his words like hammer blows, . . . questioning, explaining, expounding in a mounting crescendo. . . . exclaiming, exulting in the eternal fulfillment of Torah.” Kagan asserts that Rabbi Kotler's success in transplanting Torah "from one set of conditions to another more difficult one", was an achievement that goes beyond greatness, for he became a living link in the chain of Tradition "stretching from Moshe to Moshiach, achieving immortality within his own lifetime." Finally, you’re probably wondering about the title of this post [Shalach Manos in Kislev? ], and perhaps what it has to do with Negina. One of the foremost talmidim of Rav Aharon was none other than Reb Shlomo Carlebach, who attended the Lakewood Yeshiva from its inception in 1943, through 1947. Much has been said about the “falling out” between these two, but it is my fervent hope that the following eyewitness account will dispel some of the erroneous notions about this. Please read on. The following story is an adaptation and transcript of a true story, told by the man who was present when it happened – my good friend Reb Itzik Eisenstadt. R. Itzik is a fellow music enthusiast, who became involved with the music of both Modzitz and Reb Shlomo Carlebach in the 1950s. Known by Carlebachers as the “Treasurer of the Niggunim,” Reb Itzik accompanied Reb Shlomo on many of his journeys, both in the US and in Israel. “It was 1957, and Reb Shlomo came home from St. Louis for the holiday of Purim, and he was to read the Megilla in his father’s Shul. It was their custom to read it quickly, and indeed, they finished it, word by word, in twelve  minutes! I stood there, a child of fourteen, and I couldn’t believe it! This cannot be – yet it was! Afterwards, Shlomo signaled me to wait, even though his mother, the Rebbetzin, invited me to come up to eat. His father had a room, his study, with a sofa. This room had a window which had a staircase [or fire escape] which led outside – and this was the only way that Shlomo could leave the house unnoticed. “Shlomo told me to wait in the corner, although his mother had told us to go to bed. His parents came to check on us, to make sure that we had done so. 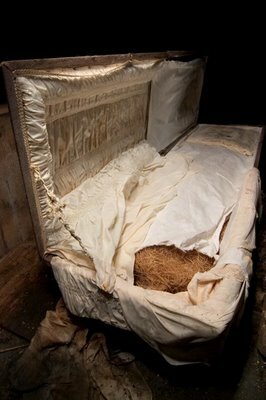 After the ‘inspection’, I snuck out of the bedroom to meet Shlomo in his father’s study, and we left through the window. At approximately 10 pm, someone came by with a car and picked us up. I thought that we must be going to Brooklyn, to 770 – where the Lubavitcher Rebbe was. But no, we were setting out on a much longer journey. “In those days, to get to Lakewood from Manhattan took about 2-1/2 hours. We arrived at the Yeshiva at around midnight. The Yeshiva was located in a small house in those days. There was a very small study hall [Beis Medrash] downstairs, with stairs leading up to a women’s section [ezras nashim]. There was also a small room upstairs, Rav Aharon Kotler’s study, which had a window through which he could observe what was going on in the Beis Medrash below. “Suddenly, a light went on in the Rosh Yeshiva’s room above the Beis Medrash. The window opened, and he looked down to see what was going on. Then he began to come down the stairs. Rav Aharon didn’t drag his feet – within seconds he was down the stairs, and walked directly over to his own shtender [lectern]. Shlomo saw this, turned around, and went over to him. Without even greeting each other, they began to discuss the Gemara Yevamos as well. “You taught us this, but I’ll add this now,” Reb Shlomo said to the Rosh Yeshiva. “You added that then, as well,” countered the Rosh Yeshiva. “After that, the Rosh Yeshiva turned to Reb Shlomo and asked him to sing. Without a guitar or anything else, Reb Shlomo sang ‘Lulei Soras’cha’ [track 8; longer link here, sung by D. Zeller] -- a niggun he had composed for the Rosh Yeshiva. Rav Aharon closed his eyes. (“If I ever saw someone ascend on High, it was then,” said R. Itzik. “He was just not there. Until Shlomo stopped singing.”) Shlomo went on with the niggun – the only one singing – for some ten or fifteen minutes. Then Rav Aharon nodded ‘goodbye’ and left, going back to his room upstairs. “Everybody says that Rav Aharon threw Reb Shlomo out of the Yeshiva, and that after he left, they had nothing to do with each other. But I heard from a Rabbi in Queens, that in the year 1951, the Lubavitcher Rebbe sent Reb Shlomo to be the rabbi of Dorothy, New Jersey – a small town not too far from Lakewood. Being that this position was not very demanding, Reb Shlomo took advantage of the amount of free time that he had, and traveled every day – to learn in Lakewood! On Motzaei Shabboses [Saturday nights], he would go to the Yeshiva and teach the boys there Modzitzer niggunim. The Rav who told this to Itzik said that there is where he met Reb Shlomo and became his good friend, and afterwards they remained friends. Shlomo learned like this for two years. Zechuso yagein aleinu - may Rav Aharon's merits protect us all! Today, 30 MarCheshvan, is the 160th yahrzeit of Rebbe Tzvi Hirsch ben R. Yehuda Leib HaKohen of Riminov, known by all as Reb Hersh M’shareis [the Attendant]. Along with Rebbe Leib Sarah’s, Rebbe Meir Yechiel of Ostrovtza, I would say that Reb Hersh was one of the most interesting Chassidic Rebbes of all time. Orphaned from both parents at the age of ten, he was taken in by his uncle, who was too poor to maintain him. He soon became a tailor’s apprentice, “but his imagination wove the fine silk of avodas Hashem [Divine service] and yiras Shamayim [fear of Heaven]. His soul yearned to gaze at the face of a great tzaddik, to learn from his deeds and attach himself to his ways.” He had heard specifically about Rebbe Menachem Mendel of Riminov, who was then in Pristik, a nearby village. Once Reb Moshe of Pshevorsk [a talmid of the Rebbe Reb Elimelech of Lizhensk] saw him and told him he should leave his work and dedicate himself to serving his Creator. Shortly thereafter, young Reb Hersh gathered up whatever little he had saved, and left his town, standing at the crossroads until a wagon came by and picked him up. In the middle of the night, they arrived in the town of Pristik, and the driver told him to get off. He wandered through the streets of town until he came across a house that was lit up…it was the home of Rebbe Menachem Mendel. He began to work there, helping in the kitchen, cutting wood, drawing water, stoking the fires, and eventually was 'promoted' to sweeping the floors. His Rebbe would say that he would 'meyacheid yichudim' [perform spiritual unifications] as he swept the floors. What impressed him so? “Even the spread that he mades on the bed sing Shira [songs of praise to Hashem]. From the time when this young man began to make the Rebbe’s bed, he heard a song arise from each part of the bed. Indeed, Tzvi Hirsch, who was a tailor’s apprentice who sewed garments with shira v’zimra, made all of his work a song. A youth as upright and straight as he was, his soul sang out in praise, and his mouth was therefore filled with song. And so, with song and praise, Tzvi Hirsch went onwards and upwards. 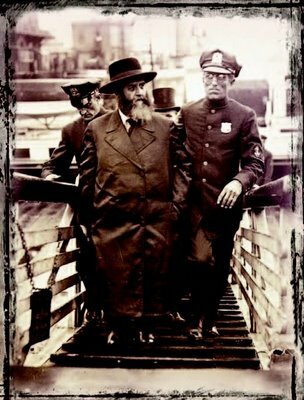 From sweeping the floors and stoking the fires, he became the main attendant and caretaker of Rebbe Mendel – and forever known as Hersh M’shareis. Indeed, Rebbe Menachem Mendel said of him, “Just as the Arizal said that he only came into this world for R. Chaim Vital [his chief disciple], so too, did I come into this world only for my m’shareis – R. Tzvi Hirsch.” Another time, when the Riminover’s close talmid, Rebbe Naftali Tzvi of Ropshitz asked for a blessing from his Rebbe before his passing, he put his left hand on his head. “And who is your right hand for?” the talmid asked. “For Hersh, my m’shareis,” was the Rebbe’s reply. Upon the passing of Rebbe Mendel Riminover, R. Hersh became a talmid of Rebbe Naftali Tzvi. It was only twelve years later, after Rebbe Naftali passed away, that Rebbe Tzvi Hirsch took over as the Rebbe of Riminov. Rebbe Zvi Hirsch of Riminov was known as Reb Hirsch M’shareis, the attendant, because in earlier days he had acted as an attendant and odd-job man in the household of his predecessor, Rebbe Menachem Mendel of Riminov. The Rebbe answered me as follows: ''Concerning the manna in the wilderness which fell from Heaven on Friday and was to be eaten on Shabbos, G-d commanded our forefathers through Moshe Rabbeinu: 'And on the sixth day they shall prepare that which they shall bring.' That is to say, we are obliged to make the preparations: the holy day itself will bring whatever is needed." And that is exactly what happened. We took out the pots, filled them with water, and left them simmering away on the fire. After a little while, we were surprised by a knock on the door. It was a villager who said he had to spend Shabbos in our town for some reason or other, and asked whether he could spend the holy day in the Rebbe’s house. He assured us that wherever he traveled he took along ample supplies of food - fish, meat, and whatever else one could need. We, of course, were very pleased to have him stay with us, and we were all blessed with an enjoyable Shabbos together. "And this is what Rashi meant when he wrote Amor k’mo Zachor v’Shamor - comparing the sayings of the Priestly Blessing to remembering and observing the Sabbath day. He was not simply giving us a lesson on the structure of verbs. He was teaching us something about the nature of the Priestly Blessing - that, just like the preparations we made for the Shabbos, it is an act of faith." Zechuso yagein Aleinu, may R. Hersh's many merits protect us! One of my favorite Rabbeim is Rabbi Cardozo, a wonderul orator, brilliant thinker and Torah scholar, who heads the David Cardozo Academy-Machon Aaron here in Yerushalayim. He is also the author of several excellent books, including Thoughts to Ponder [2 volumes thus far], Judaism on Trial, The Torah as G-d's Mind, among others. I am a subscriber to his weekly "Thoughts To Ponder" e-mail list. The following is from the Academy's latest bulletin. Rav Shefatia said in the name of Rabbi Yochanan: Whoever reads the Torah without a tune, or repeats a Mishna without a melody, about him Scripture says: ''So too I (G-d), have given them decrees which are not good," i.e. they turned My commandments into harsh decrees instead of privileges (Megilla 32a). Indeed, to study Torah without a melody is devoid of soul and of spirit. To study and teach Torah is not just an academic undertaking which can take place in a sterile environment. It requires an encounter with the deepest dimensions of the human soul, which is always alive and looking for new opportunities. The difference between a word spoken and a word sung is that a word sung is an antidote to words becoming slogans. It is an act of resistance against words becoming secularized. Simultaneously, words which are sung are words which reveal the depths of their inner meaning, surpassing the superficial and the common. We…are dedicated to make our souls sing the words of the Torah while looking for new meaning and new opportunities to make Judaism the love of our lives and that of our students and fellow Jews. In following the ways of the very first Jew, Avraham Avinu, we want to discover Judaism in a way that allows its original beauty to shine once more, so that it can be experienced by anyone who looks for religious authenticity. Today, 16 Rom-Cheshvan, is the 12th yahrzeit of Reb Shlomo Carlebach. Although much is known about him, I am honored to present some tributes from a very special book about him entitled simply, "Holy Brother." So without further ado...here we go! Shlomo saw the Divine spark in every person he encountered, and strove to ignite that spark until it burst into fiery flame. For those who had pursued nirvana with drugs, he offered the rapture of a transcendent davening; he infused holiness into the ordinary and made sacred the profane. He accentuated the positive in Yiddishkeit [Judaism], affirming and celebrating its beauty and joy. He was utopian in outlook, quixotic in his quest. In short, he was a religious fanatic. -- "Holy Sister" Yitta Halberstam Mandelbaum, from the Introduction to her book, "Holy Brother"
…Reb Shlomo Carlebach...I knew him, too. I see him once again. Always in a good mood, his eyes and his face glowing, his guitar slung across his shoulders, his thirst for a life of singing and of hope. Traveling across the world in search of lost souls, he would sing of the love that everyone should have for his fellow man, for all of creation, and naturally for the Creator Himself. He attracted young people most of all, and they adored him. He made them laugh, dance, dream. He would help them overcome the bleak intoxications of daily life by modeling for them the spellbinding and mysterious worlds that every human being carries within himself. He would tell the Chassidic tales, giving wings to their imagination. He would show them how to discover the beauty of prayer. For him, all human beings were worthy of attention. He would suffer with those who suffered. A lover of loving, he would never offend the person to whom he was speaking. Where others might use argumentation and recrimination, he preferred praise. I never once heard him speak ill of another, even of those who cared a little less for him. It's all so simple. -- Elie Wiesel, Forward to "Holy Brother"
Rabbi Shlomo Carlebach, one of the most influential and internationally renowned Jewish personalities in the twentieth century, died at the age of 69 on October 20, 1994, leaving behind hundreds of thousands of mourning fans and followers throughout the world. 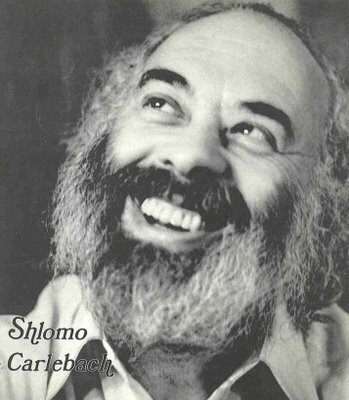 Alternately known as "The Dancing Rabbi", "The Singing Rabbi,'' or ''The Hippie Rabbi,'' Shlomo Carlebach was one of the most original and inspired Jewish personages of this century, probably second only to the late Lubavitcher Rebbe in his universal appeal and extensive international impact. 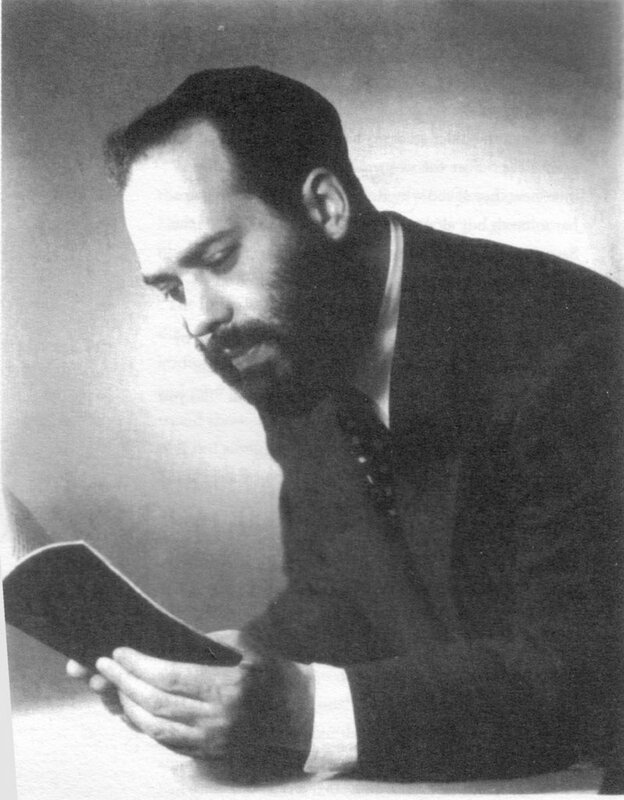 Widely regarded both as the father of contemporary Jewish music (with over two dozen Jewish albums to his credit) and one of the original founders of the Jewish 'outreach' movement, Rabbi Carlebach's name was a household word throughout the world. He was a bridge-builder and ambassador of love and joy, and his message of openness and inclusion spoke to Jews and non-Jews of all stripes and persuasions. His ''Chassidim'' (followers) represented every spectrum of Jewry and included spiritual seekers of all faiths. He was a ubiquitous presence at ecumenical gatherings and conferences and a popular attraction at New Age retreats. Rabbi Carlebach was a songwriter, musician, and recording artist who performed alongside Bob Dylan, Joni Mitchell, and Pete Seeger at ''peace and love'' concerts in the '60s. He rose to prominence in the ''New Age'' world when he established the famous ''House of Love and Prayer'' in San Francisco in 1967 to draw back young Jews who felt alienated by Judaism. Embracing the earliest visions of Chassidism, with its call to serve G-d and reach other Jews through joy, Rabbi Carlebach brought a new creativity and spirit to contemporary Judaism, saved a generation of Jews from wholesale rejection of their faith, and initiated a movement that now extends worldwide. -- Yitta Halberstam Mandelbaum, from the biographical introduction to her book, "Holy Brother"
Yehi Zichro Baruch - May Reb Shlomo's memory be a blessing for us all! In honor of the yahrtzeit of the great Rabbi Shlomo Carlebach, Nachum Segal will be presenting 3 shows dedicated to his music and legacy. More info here. “…vatukach haIsha beis Pharaoh – and the woman [Sarah] was taken to Pharaoh’s palace [home]” – Breishis 12:15. It seems to me that Sarah Imeinu was the first captive to be mentioned in our Holy Torah. It is no wonder, then, that she appears to explain the reasoning for ‘a taste of captivity,’ in the story below. Today, 11 MarCheshvan, is the 209th yahrzeit of Rebbe Menachem Nachum, founder of the Chernobyl Chassidic dynasty. He was a student of the Baal Shem Tov and the Maggid of Mezritch, and one of the pioneers of the Chassidic movement. As a young man, he mastered nigleh, the Oral tradition contained in the Talmud and Halachic codes, but showed a predilection for nistar, the esoteric tradition of Kabbalah, delving into the hidden and mystical meaning of the Scriptures as propounded by Rabbi Yitzchak Luria, known as the Arizal HaKadosh. With advent of Chassidus, Rebbe Nachum traveled to Medzibuzh to meet the Baal Shem Tov, the founder of Chassidus, the new movement of religious revival; Rebbe Nachum became his devoted disciple. After the Baal Shem Tov's passing, Rebbe Nachum accepted the Maggid of Mezritch as his mentor. Since Rebbe Nachum was a gifted orator he was assigned the task of propagating the ideas of Chassidus. With his saintly demeanor and spellbinding rhetoric he captivated his audiences, inspiring them to follow the ways of Chassidus, of approaching G-d through joyful and fervent prayer and enthusiastic observance of mitzvos. Although a poor man himself, he distributed his last penny to the needy. Rebbe Nachum's book Me'or Einayim ("Light of the Eyes"), comprising insights on the weekly portions of the Torah, reflects his proclivity to Kabbalah. It has gained widespread acceptance as one of the major works of Chassidic ideology. He was succeeded by his son, Rebbe Mordechai of Chernobyl. The following story has been excerpted from Rabbi Yitzchak Ginsburgh’s website, The Inner Dimension. Rebbe Menachem Nachum of Chernobyl dedicated much of his life's work to redeeming imprisoned Jews. In those days, if a Jew could not pay his debts to the local landlord, he was often thrown mercilessly into a dungeon or pit, sometimes with his entire family. Rebbe Nachum raised money to redeem these unfortunate Jews, saving them from sure death. Our Sages say that there are two commandments that are called "great mitzvos." The first is the commandment to procreate, and the second is the commandment to redeem imprisoned Jews. When one redeems a Jew, thereby saving his life, it is as if he given birth to his soul. It came to pass that Rebbe Nachum was also imprisoned. 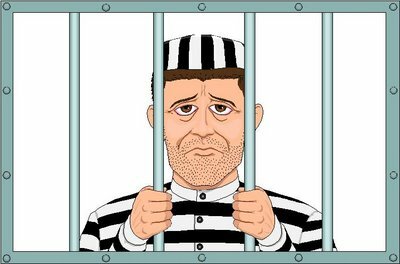 Daily he would bribe the prison warden to let him out of the pit for a short time to pray and to immerse in the mikveh. One day, Rebbe Nachum did not bribe the warden. He explained that he did not need to do so, for he would be released from prison on that very day. When asked how he knew that he would be released, he related that on that night Sarah had come to him in a dream. Rebbe Nachum asked Sarah what he did to deserve being thrown into a pit. Sarah answered that because Rebbe Nachum had devoted his life to redeeming captives, it was necessary for him to experience a taste of captivity so that he could consummately understand the situation and subsequently devote himself to this mitzva in an even more rectified manner. When a person understands why G-d has involved him in a certain situation, this releases him from the situation. Thus, as soon as Rebbe Nachum understood the reason for his imprisonment, he knew that he would be released on that very day. Another version of this story can be found here. Zechuso yagein Aleinu - May the Chernobler's merits protect us!